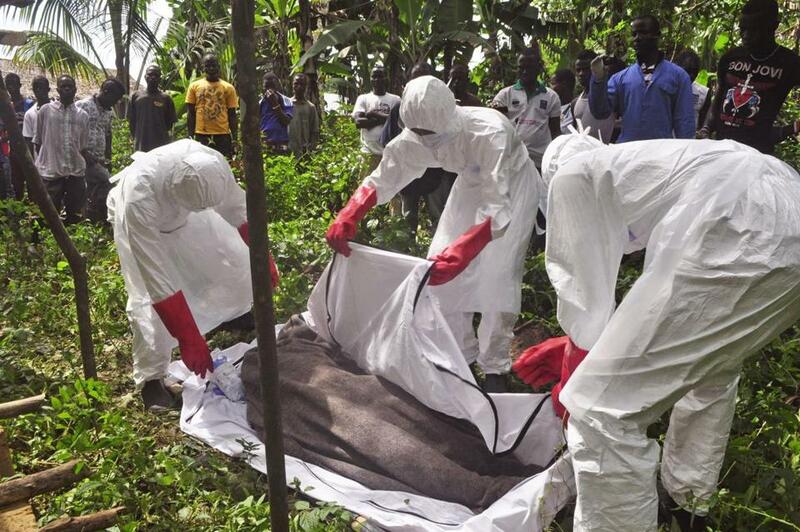 Health workers prepared the body of a man suspected of dying of Ebola near Monrovia, Liberia, over the weekend. FREETOWN, Sierra Leone — Another doctor in Sierra Leone has tested positive for Ebola, marking a setback for efforts to keep desperately needed health care workers safe, authorities said Sunday. Dr. Brima Kargbo, the government’s chief medical officer, confirmed that a fifth doctor has tested positive. The other four all have died from the virus that has killed nearly 5,000 across West Africa. The sick physician has been identified as Dr. Godfrey George, medical superintendent of Kambia Government Hospital in northern Sierra Leone. He was driven to the capital of Freetown after reporting he was not feeling well. In a separate development Sunday, France said it is treating the first confirmed case of Ebola in that country. The French government said it is treating a UNICEF employee stricken in Sierra Leone. The French Health Ministry said the patient was evacuated on a special flight and is undergoing treatment in ‘‘high-security isolation’’ in Begin Army Training Hospital in Saint-Mande, near Paris. The patient’s name was not released. UNICEF spokeswoman Marixie Mercado confirmed that a team member in Sierra Leone was being treated in France. In September, France took in a Doctors Without Borders medic who had Ebola. She later recovered. France has not had any Ebola cases on its territory, but has been active in the fight against the disease, particularly in Guinea, a former French colony. Canada’s government said last week that it is suspending visa applications for residents and nationals of countries with ‘‘widespread and persistent-intense transmission’’ of the Ebola virus. With its decision, Canada joined Australia in suspending entry visas for people from Ebola-stricken countries in West Africa in an attempt to keep the deadly disease away. Canada has not yet had a case of Ebola. Canadians, including health care workers, in West Africa will be permitted to travel back to Canada, the government said. The countries most severely hit by the worst Ebola outbreak ever are Liberia, Sierra Leone and Guinea. Canada receives few travelers from those countries, which have no direct flights to Canada. A similar move by Australia was slammed Wednesday by Dr. Margaret Chan, the World Health Organization’s director general, who said closing borders will not stop the spread of the Ebola virus. ‘‘We have instituted a pause, but there is room for discretion and if we can be assured that someone is not infected with Ebola,’’ Menard said in an e-mail. The government said Canadian citizens or foreign nationals with a visa and foreign nationals who do not need visas will continue to be screened at ports of entry in Canada and will face health screening.